How you plan your week will help to become more organized as you will know what is coming! 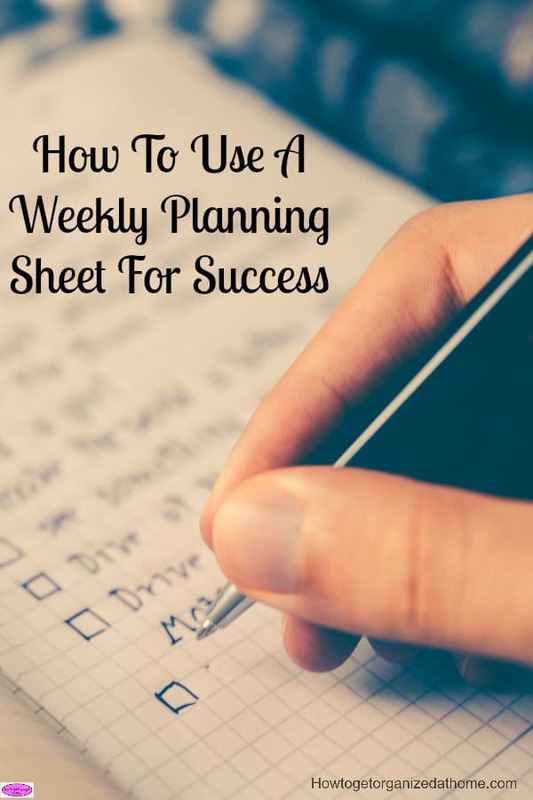 Use a weekly planning sheet to get an overall idea of how you want your week to look and if there is any activities or appointments you need to plan for! 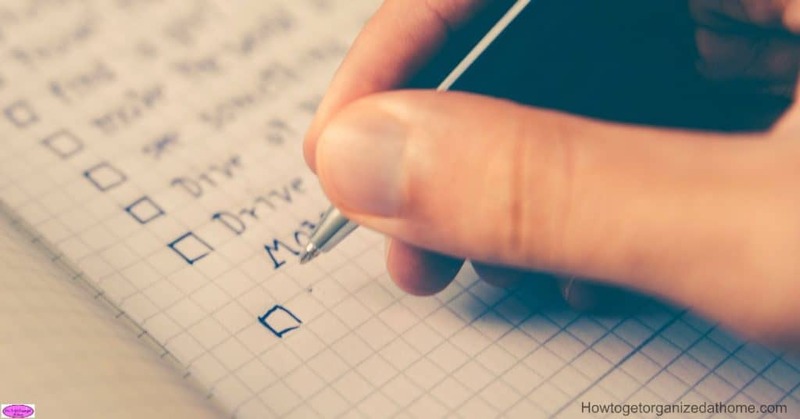 Planning makes organizing your time so much easier, it is something that takes practice and sometimes you might find it a pain, but the more you plan the less likely you will miss an appointment or forget to buy something! Yes, I love lists, I love the idea of having all the information ready and knowing what needs doing! Running a business and a home takes time, there are multiple things that need doing and it is so easy to forget something! I use a diary for all my appointments and anything that I need to do, however, it is one page per day and I can’t see the week ahead! I could easily forget to plan for an appointment and that is a disaster waiting to happen! So, each week I have a weekly planner, that I print out and mark up any time for appointments and if I need to include travel time! Click here to get a free planning sheet! It then gives me an overview of the week ahead! It is very easy to just plod through your day, distracted by different tasks that you need to do, often not getting even one complete. Knowing how you want to spend your day and what time you need to get your to-do list complete makes life so much easier! Taking control of the time that you have, planning chores and appointments in that time will give you more time to do the fun things! It is so easy to get distracted, to not find the energy to tackle a project or put it off because you don’t think you have the time. Creating time for the things that you want to do means looking at your time and using it wisely. This isn’t easy, there are times I get distracted and suddenly my timings are off! I like to leave a little buffer in my day to account for this, however, it does mean that I will miss out on some relaxation time later in the day! You must check your weekly planning sheet, it is the only way that you can ensure you are keeping on track! With a paper weekly planning sheet, you won’t get notifications when appointments are close, however, having fewer distractions can make life less stressful! If you want reminders of events and appointments it is possible to set these reminders when you are planning your week! It is so easy to share your schedule once you have planned what you need to do and when. Just because you write it out on paper doesn’t mean that it has to stay in this format. How you store your weekly planning sheets will depend on how you work, I like them on my desk, they sit on top of my desk writing pad, alternatively, you could store them in a file similar to this one, it makes transporting it easier! I like to have next week’s planning sheet ready for me to note down any appointments I need to remember and block this time out! It is important to physically see this time block as it makes it easier to plan around this and not double book yourself! Then just block out time for different activities that you need to do during the day. Don’t forget to put in meal times and time for rest and relaxation! I write the higher level task on my weekly planning sheets, like housework or blogging. In my diary, where I plan the details of my day are the actual housework task or work tasks that I need to do! Planning your week in this way will allow you to see the time you have available and the appointments you have to attend. It makes life so much easier and a lot less stressful! Therefore, if you are wondering how a weekly planning sheet is going to help you, it will give you more time to do the things you want to do rather than procrastinating on all the things you need to do! Looking for more articles on planning and routines? How To Create An Evening Routine That Works is a great place to start!